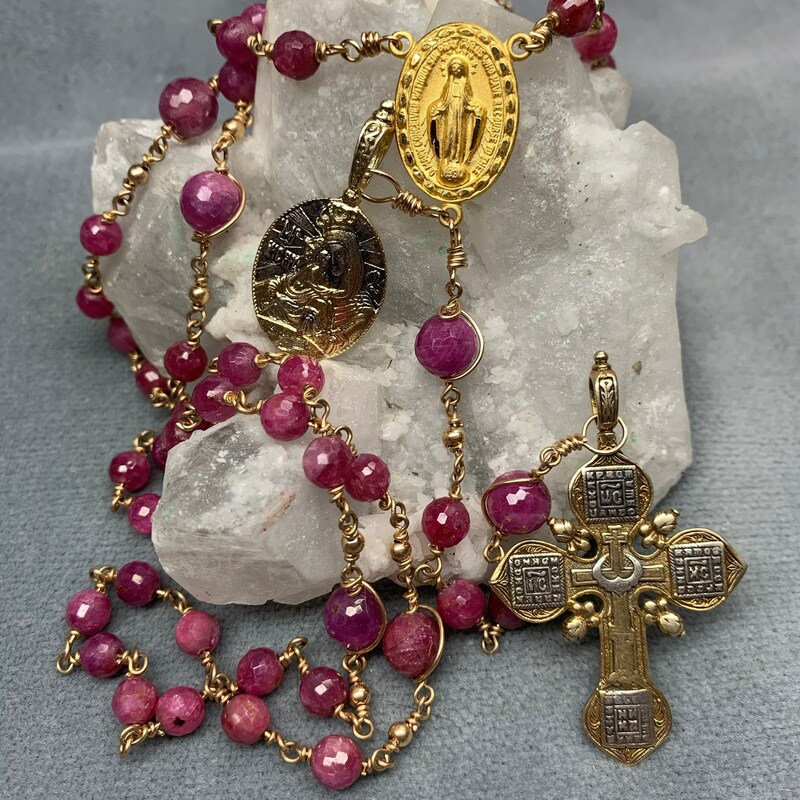 This exceptional Pink Sapphire in 14k Gold Rosary is a one-only unbreakable Rosary, wire wrapped for beauty and durability. The pink Sapphire is spectacularly deep, rosy pink that is unmistakable. I've wrapped each bead in 14k Gold wire, keeping it simple--5-6mm Aves and plump, 8mm Paters, separated by small, gold spacer. The Orthodox Cross, highly decorated front and back, and equally detailed Mother and Child Icon are Gold accents vermeiled over Sterling, exquisite, and created by fine Israeli artisans. For the center, a Gold Miraculous medal. 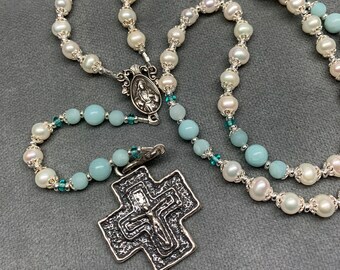 As with all my Ultimate Rosaries, this will be one-of-a-kind and unique. Nothing was spared to make this the best I can offer, and I'm pleased to offer it to you. 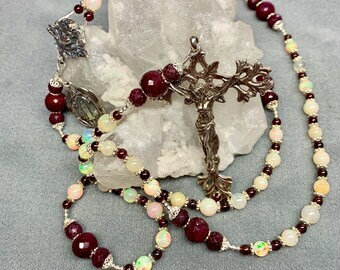 Each precious bead is looped and double wrapped at each end in solid 14k Gold wire for a connection so secure and durable that this Rosary is guaranteed against breakage for life. Period. You'll have to wear through the wire! It is approx 22" long, and is light and compact enough to easily hold throughout the entire Rosary. As always, this Rosary will arrive ready for presentation, boxed in silver and in a beaded velvet and organza gift bag. It also requires three times more wire--nearly a half an ounce for a larger, 8mm bead size Rosary--than a traditional Rosary. Keep in mind the additional time and wire required when you consider the cost of a fine, wire-wrapped Rosary. 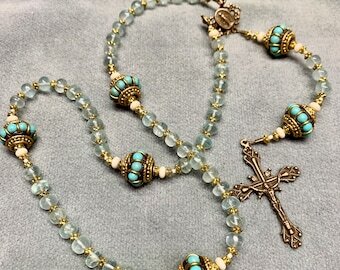 Because the wire wraps both ends, poorly made wire-wrapped Rosaries can have 'stickies'--I carefully fashion and crimp each bead to prevent any unpleasant jabs!